Many social innovations such as Earth Day have origi­nated from ideas and suggestions offered by individuals outside the government, and community-based movements often spurs government agencies to act on such ideas. 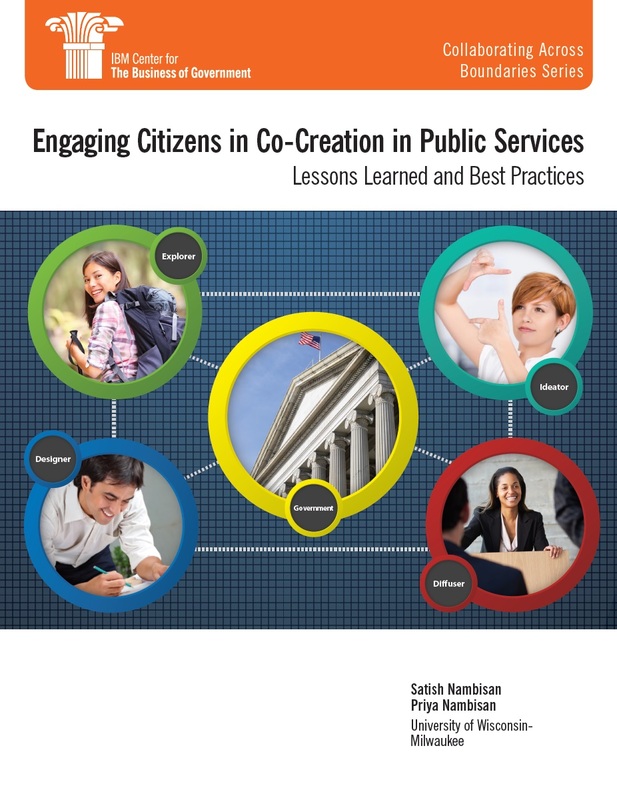 “Engaging Citizens in Co-Creation in Public Services: Lessons Learned and Best Practices” published by IBM Center for The Business of Government present an innovative frame­work which views citizens as “co-creation” partners with government for the development of new public services. Fiscal austerity has made it difficult to continue with some of the existing resource-inten­sive business models and problem-solving modes in government. The increasing complexity of the problems to be addressed demands collaborative ap­proaches with external entities as well, particu­larly with citizens. The availability of new technologies including social media has radically lowered the cost of collaboration and the distance between government agencies and the citizens they serve. With the confluence of these issues, the citizen’s role in pub­lic services has been redefined by government agencies at all levels—a shift from the role of a passive service beneficiary to the role of an active informed partner, or co-creator, in public service innovation and problem-solving. These four citizen roles imply different types of contributions in civic problem-solving, different types of government-citizen interactions, thereby the need of different types of mecha­nisms and support infrastructure. Based on these two elements, a wide range of mechanisms can be employed as specific ways in practice by government agencies, including mobile apps, e-petitions, open-source databases, data analysis communities, contests and competitions, innovation jams, open data­bases, participatory design workshops, and dedicated online citizen communities. The lead agencies should carefully select the most appropriate approach to engage citizens by considering a range of factors related to the problem context, including four key issues: the duration of citizen engagement (short-term or long-term), the mode (Individual or collective), the prerequisites, and the ease of problem partitioning. The best way to manage citizen expectations is to be open and trans­parent in every way possible. Government agency should adopt a set of mechanism to enhance three types of transparency: role transparency, process transparency, and outcome transparency. Government agencies need to ensure that they adopt strategies that would link the “internal” (the agency employees, structures, and processes) with the “external” (citizens and citizen communities). They need to make appropriate changes to its internal structures (e.g., create new roles), processes (e.g., institute processes for project selection), and systems (e.g., establish new communication forums). Government agencies should embed its citizen engagement efforts in a larger initiative associ­ated with its core agenda and thereby make such efforts more meaningful to both the agency and citizens. New technologies contribute a lot to active citizenry for problem-solving through facilitating easier access to public data, enhance government transparency, and reduce the distance between the citizen innovator and the gov­ernment agency. However, rather than technology itself, the motivating objective should be the reason for instituting citizen co-creation initia­tives and to help the government get a deeper personal connection with citizens and their issues. Recommendations and the framework introduced in the report try to help government move in this direction. both address how the federal government is using competitions to engage citizens in the development of new ideas and new products. Federal Ideation Programs: Challenges and Best Practices discusses how the federal government can tap creative thinking from across the citizenry to come up with new approaches to solving problems.